The New Shapes Of Decanting. The Art Series Decanters. This collection of limited edition decanters were designed exclusively for Wine Enthusiast and bring a sophisticated style to wine decanting at an attractive price. 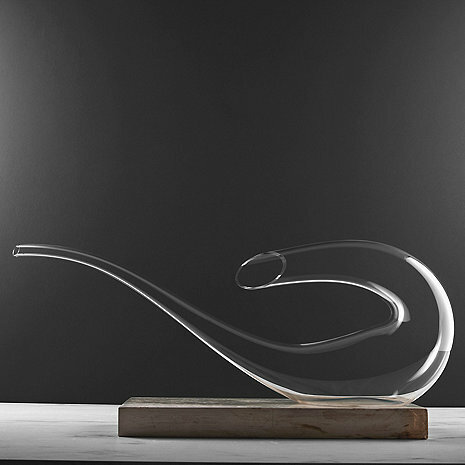 The Bass Decanter, part of the Art Series, doubles as a sophisticated centerpiece. How do you pour from it? It doesn't seem like something you can hold. The Wine Enthusiast Art Series Bass Decanter should be held by both hands. One hand to cradle the decanter and one to tip the decanter to pour the wine. It is a unique decanter. We use it as a decorative piece on top of our wine credenza..
How do you fill and then pour from this decanter? BEST ANSWER: The Wine Enthusiast Art Series Bass Decanter is filled with wine by pouring into the large opening and you pour the wine out of the small opening. So very pleased with the wine decanter. It almost looks like a piece of art! This decanter is a functional piece of art. Just beautiful! These decanters make wonderful gifts! We gave it as a thank you gift to friends. They were very happy with it, it fit their style. I think this series of decanters is very elegant. I have given a couple as gifts. The decanter is huge! The photo does not give it the proper scale.